Yup. Jeremy, Mary and I should be, at this very moment rockin' out, old-school-style, to Styx, REO Speedwagon and Def Leppard. But no. 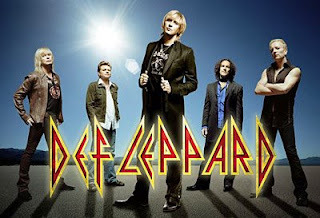 Joe Elliott (lead vocals) had to go and get an "upper respiratory infection", thus "postponing" the Canadian leg of their tour. Who knows when they will reschedule.... Looks like their North American tour winds up April 27 and their Asia/Europe leg starts May 16. Wonder if they'll put it in between those dates or wait until their whole tour is done July 17 and tack us on the end... We'll see!